Will look towards the developing world for new trade partners. South Korea began to seek free trade deals in 1999, when it started negotiations with Chile, its first partner for a free trade agreement that took effect in April 2004. Over the past 20 years, 15 FTAs between Korea and its counterparts have taken effect, with 52 partner countries in total. The 15 FTAs include those with three continental economic blocs: the European Free Trade Association (four countries), the Association of Southeast Asian Nations (10) and the European Union (28). Korea has also signed FTAs with five countries in Central America, which will take effect after ratification by legislators. 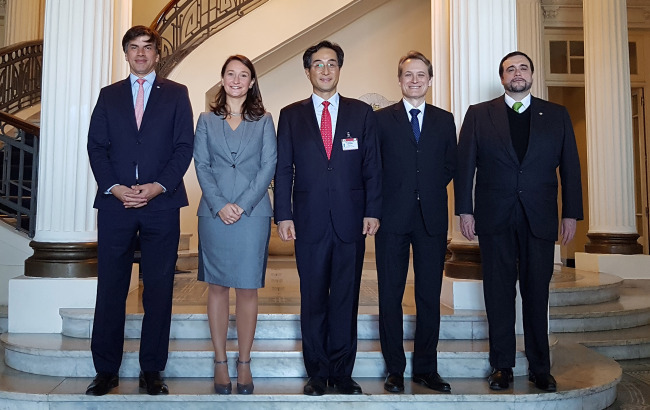 In addition, Korea is negotiating FTAs with such countries as Ecuador, Israel and the South American trade bloc Mercosur consisting of Argentina, Brazil, Paraguay, Uruguay and Venezuela. Preliminary meetings with Mexico are also underway to embark on FTA negotiations. Among these talks, the move led by the Ministry of Trade, Industry and Energy to see the effectuation of deals with South and Central American nations is aimed at gaining an advantageous position in the emerging market before Japan or China, according to officials at the Government Complex Sejong. Likewise, Korea is focusing on emerging markets in the area of FTAs, in line with the road map unveiled by Trade Minister Kim Hyun-chong last year. “It is necessary to diversify export destinations targeting emerging countries,” he said. He added that Korea plans to expand FTA deals up to the level at which partners account for about 90 percent of the world’s gross domestic product in the coming years, from the current 77 percent. 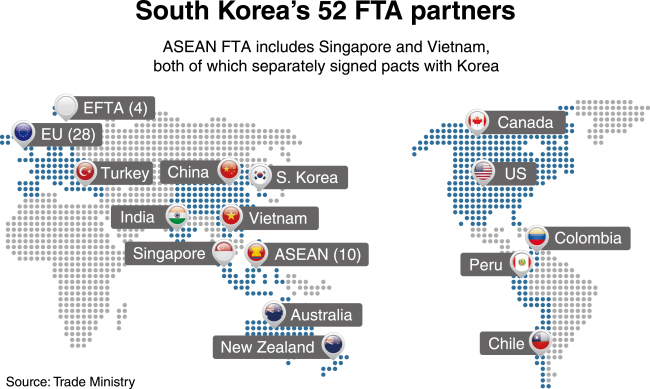 Korea has no FTA counterpart in the Middle East. Although it held preliminary meetings with the six-member Gulf Cooperation Council in 2008, bilateral preparation procedures have halted after their third round of meetings in July 2009. The six members are Saudi Arabia, Kuwait, United Arab Emirates, Qatar, Oman and Bahrain. Market insiders point out that more fundamental access is needed to revitalize talks with the GCC or make inroads into other markets involving Africa. A company executive cited the role of the local private sector, which include builders and petrochemical businesses with long-term experience of operations there. Meanwhile, the government is poised to resume meetings with the Muslim countries. Minister Kim visited Qatar and Oman earlier this month to discuss economic cooperation. He reportedly met with senior officials from sovereign wealth funds and trade ministerial counterparts in the two countries. Businesses in the private sector are pinning hopes on the government’s upcoming trade talks, which could pull up the ratio of trade volume with countries like Saudi Arabia (ninth-largest trade partner), India (11th), Russia (12th), Mexico (15th), UAE (16th) and Iran (20th). Despite the Korea-EU FTA and Korea-EFTA FTA with a combined total of 32 countries, only two — Germany (eighth-largest) and the UK (17th) — are among the nation’s top 20 trade partners, according to 2018 statistics from the Korea International Trade Association.